The most important consequence of induction is the existence of electromagnetic waves. Whereas a gravitational wave would consist of nothing more than a rippling of gravitational fields, the principle of induction tells us that there can be no purely electrical or purely magnetic waves. Instead, we have waves in which there are both electric and magnetic fields, such as the sinusoidal one shown in the figure. 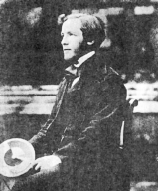 Maxwell proved that such waves were a direct consequence of his equations, and derived their properties mathematically. The derivation would be beyond the mathematical level of this book, so we will just state the results. A sinusoidal electromagnetic wave has the geometry shown in the figure above. The E and B fields are perpendicular to the direction of motion, and are also perpendicular to each other. If you look along the direction of motion of the wave, the B vector is always 90 degrees clockwise from the E vector. The magnitudes of the two fields are related by the equation |E|=c|B|. Two electromagnetic waves traveling in the same direction through space can differ by having their electric and magnetic fields in different directions, a property of the wave called its polarization. The first two humans to know what starlight was. Once Maxwell had derived the existence of electromagnetic waves, he became certain that they were the same phenomenon as light. Both are transverse waves (i.e. the vibration is perpendicular to the direction the wave is moving), and the velocity is the same. He is said to have gone for a walk with his wife one night and told her that she was the only other person in the world who knew what starlight really was. 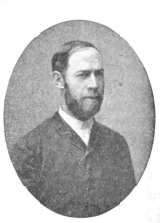 Heinrich Hertz (for whom the unit of frequency is named) verified Maxwell's ideas experimentally. Hertz was the first to succeed in producing, detecting, and studying electromagnetic waves in detail using antennas and electric circuits. To produce the waves, he had to make electric currents oscillate very rapidly in a circuit. In fact, there was really no hope of making the current reverse directions at the frequencies of 1015 Hz pos sessed by visible light. The fastest electrical oscillations he could produce were 109 Hz, which would give a wavelength of about 30 cm. He succeeded in showing that, just like light, the waves he produced were polariz able, and could be reflected and refracted (i.e. bent, as by a lens), and he built devices such as parabolic mirrors that worked according to the same optical principles as those employing light. Hertz's results were convincing evidence that light and electromagnetic waves were one and the same.